Access Coin Falls Casino on 1st of April and choose one of these awesome offers! You will be able to receive a 100% match bonus up to £20 or 40 Spins. Deposit at least £40 for 40 Spins. 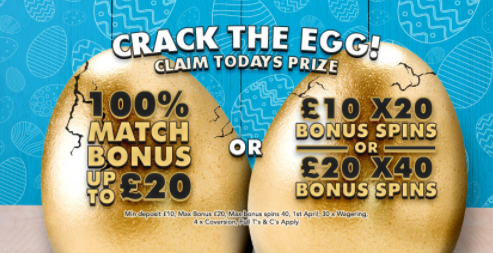 These extra rounds are valid only on eggOmatic. The promotion runs only for one day and all British players can qualify for it. Don’t forget that you must wager the deposit and bonus amount 30 times to cash-out your winning from the match deal. For any withdrawals from the spins, you need to play through the bonus amount 30 times. The conversion from the bonus funds is limited to 4 times. You won’t find such a rewarding offer so you should get it now!